One of the best ruthenium dye for the sensitization of titanium dioxide in Dye Solar Cells, also know as N719 in the literature. 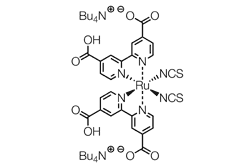 Ruthenizer 535-bisTBA belongs the ruthenium dyes family, which is especially suited for the sensitization of titanium dioxide in Dye Solar Cell applications. This compounds, also know as N719 in the literature, is one of the most efficient sensitizer in Dye Solar Cells and is widely acclaimed over the DSC community. Ruthenizer 535-bisTBA sensitizes very efficiently wide band-gap oxide semiconductors, like titanium dioxide, up to a wavelength of 750 nm. It is moreover advantageously more soluble than Ruthenizer 535. A typical staining procedure consist in preparing a 0.5 mM solution of this dye in ethanol, in which the titania electrode will be soaked for a few hours. The resulting stained electrode has simply to be rinsed with ethanol before being assembled with the rest of the solar cell. The staining bath can even be re-used like such for several times. Advanced experimenters my also use a staining additive like chenodeoxycholic acid in order to give an extra boost to the performances of their solar cells. Chenodeoxycholic Acid is also available from our shop at an affordable cost, don't miss it!